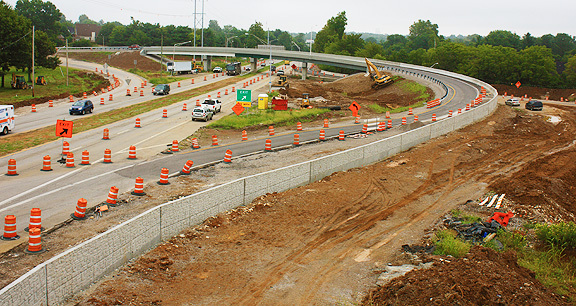 Project obstacles and solutions: As part of the widening of New Circle Road in Lexington, Kentucky, the Kentucky Transportation Cabinet designed a new interchange and overpass bridge onto Versailles Road (U.S. 60). This interchange is key to the City of Lexington as it feeds traffic to the airport and Keeneland Thoroughbred Horse Racecourse. ATS and Central Bridge were selected as the contractors for this project. This new interchange was unique from both the aesthetic appeal of the concrete used on all of the upright portions of the project as well as the sound barrier that the walls on the approach ramp provided. This interchange is on the far west side of Lexington where the rolling green hills of stately manor horse farms meet the commerce of the city. The bridge is a typical overpass with three staggered hammerhead pilings to support the deck. However, the concrete pillars were poured with a cut stone block pattern. This was then sprayed with a white surface color. The long, approach walls were poured as a half F-safety barrier on the inside of the walls. The outside also had the cut stone pattern. This was a challenge for Central Bridge to pour. Typically safety walls are poured with a slip-form paver. Due to the textured pattern, each wall panel had to be formed up and poured individually. IMI worked with Central Bridge to provide a mix that met KYDOT standards and also filled all the gaps in the textured forms. IMI supplied 20,000 yards of concrete for this ramp and bridge project. 4,000 yards were used on the barrier walls. For more information on pouring textured walls with concrete, contact the sales representative for the concrete plant nearest your location. Click here.